In stock. Tent usually ships same business day. If selecting the free ground tarp option, the ground tarp will ship separately around 4/30/2019. 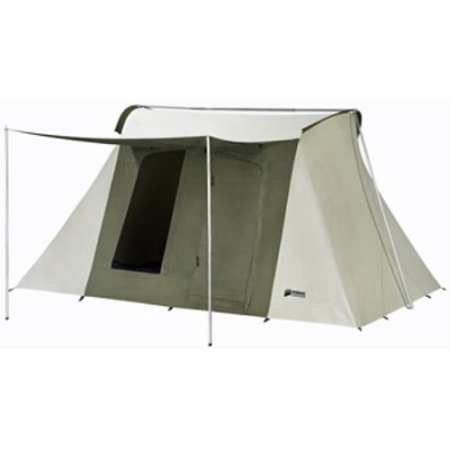 This Kodiak Canvas 10 x 14 tent is great whether you are headed to the campground with your family or elk camp with your hunting buddies. This rugged, all-season tent is well suited for any occasion. Made with premium grade, Hydra-Shield, 100% cotton duck canvas (walls: 8.5 oz, roof: 10 oz). The tight weave and silicone finish make the canvas watertight yet breathable, minimizing condensation and mugginess. Go ahead and touch the inside walls during a downpour, this canvas will not wick water. 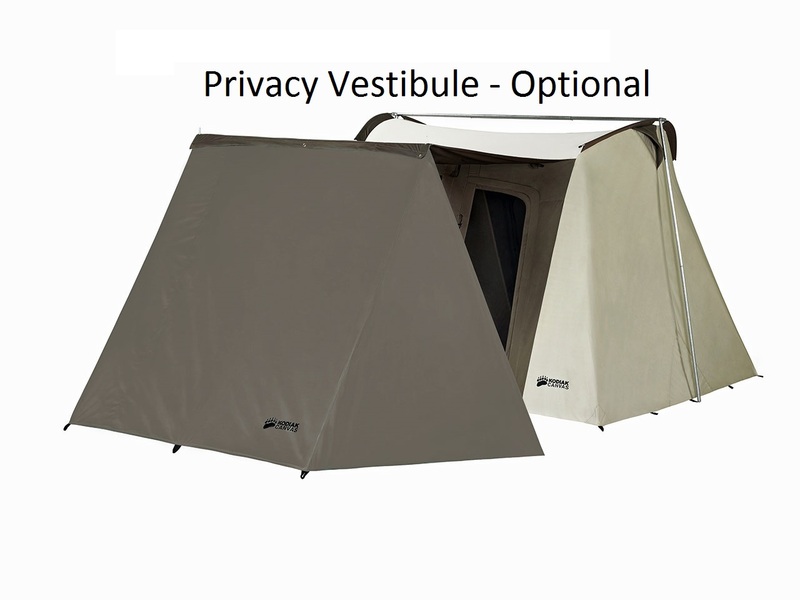 This particular model sells out before all the other canvas tents we carry. The Flex-Bow frame has tempered spring steel rods that keep the tent taut, and robust 1 inch steel tube poles that will hold up to fierce winds. The floor material is a super-duty, puncture resistant, 16 oz vinyl with welded seams that keeps water out. Easy, one-person setup takes only a few minutes after you have it staked out. The steep walls and 6 ft 6 in high ceiling provide a roomy interior with stand-up, walk-around comfort. Two large doors with top rated #10 zippers give convenient access to front and back. Two windows to allow ample air flow. Windows have no-see-um screen mesh, keeping out the smallest pests. A large awning provides shade and a covered entry. The large storage bag means no cramming into an undersized bag. Hefty 10 inch steel stakes included. Durable, watertight and breathable Hydra-Shield 100% Cotton, Duck Canvas. Flex-Bow Frame: Exceptionally sturdy. Keeps tent taut. Quick and easy, one-person, setup. Spacious 6'6" ceiling height provides walk-around comfort. Two large D-shaped doors (front and back) with heavy duty zippers. Large windows with no-see-um mesh. Large awning measuring 4 ft Deep x 7 ft Wide with a height of 72 inches, Heavy-Duty 10 inch, steel rod, stakes. Handy large storage bag. Includes the newly redesigned metal-reinforced stake loops. Unlike many other stores, Competitive Edge only sends these with the new upgraded improved metal reinforced stake loops. Kodiak Canvas Camping Equipment Tent Specs: Approximately Weight: 79 lbs (Includes tent, poles, stakes, and storage bags). Ceiling Material: 10 oz Hydra-shield cotton canvas. Wall Material: 8.5 oz Hydra-Shield cotton canvas. Floor Material: 16 oz vinyl. Polyester reinforced. Frame: 1 inch, galvanized, steel tubing. Flex-Bow Rods: 3/8 inch, solid, spring steel. All-Season: Can be used year-round but not designed for harsh winter mountaineering. This is the ideal tent for the Boy Scouts and youth church groups. It breathes well, has a large footprint, and doesn't include the bells and whistles that the more expensive models have including a gear loft and extra hanging storage bags - fewer bells and whistles that scouts have been known to damage or break. This basic tent is great for most campers. The extra windows on the other versions are great for summer camping when the nights are quite hot, but because these breathe well, they cool down as the outside temperature cools. Plus, it does have windows on the front and back to allow for ventilation and a great view of the campground. The tarp isn't a bad idea for scouts and some tend to simply put the tent wherever they'd like without clearing the brush or checking for unusually sharp rocks pointing up before putting down the tent. It also makes it easier to clean the tent. Beach or desert campers even use the tarp inside the tent to avoid sweeping it out when they break camp. 11-7-2018You're videos helped me to find the BEST tent.I seasoned it last night with rain (bone-dry), and today dried it out with wind gusts up to 40 mph! It is a solid tent! 40 mph wind is nothing. Not too loud inside either.Most importantly, NO BS! Very fast shipping, and well described. You're videos we're spot on . 40 mph gusts (don't try this at home ... LOL)I would recommend anyone to shop with Competitive Edge Products because it has been THE BEST experience shopping EVER!Thank you so much, you guys ROCK! Got this tent in two days! Needed a tent for a cook tent at hunting camp. Was impressed with the quality of the zippers, ease of putting it up and down. The ground tarp was perfect. Cant beat the price and the free shipping! Had a short but intense rain shower, no leaks. Had moisture in tent after cooking dinner, coffee etc.,it was gone in 10 min. with the temp. outside at 80+ degrees.Great tent! We absolutely love this tent. Q: Are the poles covered under the warranty or can be purchased separately? The pole that goes across the top of the tent between the spring bars bent in a recent storm and needs to be replaced. Your assistance is greatly appreciated. -Thank you. Q: Do gear loft and storage pouches come with this tent? A: It does include storage pouches located under each window-they are sewn on. However, if you are referring to the extra pocket organizers and hanging bag organizers those are only included on the deluxe and the super deluxe VX models. The gear loft only comes with the deluxe and the super deluxe models as well. Q: What is the difference between polyester floor and canvas floor? A: The Kodiak tents floors are vinyl-16 ounce-very heavy-duty. The walls and roof are Canvas, and there is a campus liner available, but the floors are vinyl. The nice thing about the floors is that being vinyl they do not have a crunching sound like most tents floors where it sounds like your walking on a very thin tarp. None of the floors are polyester. Q: I know that the 10x14 Flex Bow basic does not come with gear loft and organizer pouches. But are there any loops sewn in to the top edge where they would be useful in hanging anything say a small led light? Q: If the 6044 tent comes with the full floor is the extra tarp to put under the floor area of the tent for extra protection? A: The ground tarp is to put underneath the floor to make it easier to break camp-making it easier to clean. Some people use the tarp inside if they are camping in the desert so they don't have to sweep the tent out when they break camp. The tarp is totally optional-certainly not required. Q: The basic 10×14 don't come with storage bag? Does it come with anything too store it in when not being used. A: It does come with a storage bag, just not the deluxe storage bag that is much easier to use. If you order a deluxe, or super deluxe tent, then it will come with many more accessories, as well as an upgraded storage bag. I recommend ordering one of our other tents, and soon, as we often sell out of most everything by August. A: Can you purchase a deluxe bag when ordering this tent? What is the extra cost? Q: If I pick this up at your store in Utah is it a better price than just ordering on line with free shipping? We need it for girls camp in June. A: Yes! We do have a will call pick up option available with a discounted price. The Will Call price on that is $420 before tax (because it is in the same state as you). Just call us at 866-308-5484x2, and we’ll give you the discount. They can be picked up from the warehouse in Salt Lake City down by the airport. We will give you more info when you order. Q: Is the tarp that comes with it for "free" the actual Kodiak ground tarp or a generic tarp? A: The tarp is the actual tarp provided by Kodiak; however, it is regular polyester, not a canvas drop cloth. Q: Does this come with a tent bag and pole bag, or do they come separate? A: Yes, this tent includes all of the necessary bags and pieces. 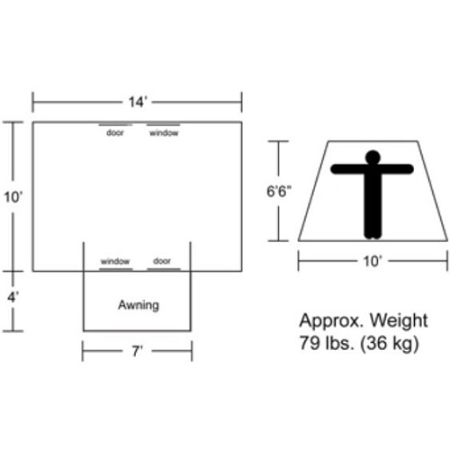 Q: I just ordered this tent, but I need to confirm that two windows means in the back of the tent... That the doors are not counted as Windows. Doors in front windows in back? A: There is a door and a window in the front end of door and window in the back. The doors do not have screens. Feel free to contact us with any other questions. Q: I live in Redondo beach California. When can I expect arrival? A: Delivery to California is typically about 2 business days, as long as you order before noon. Q: I have a couple questions. One should the heads on the t-bars be a little bit wobbly? 2 How much would it cost for an additional set of the two t bars(not the rods)? Also is the actual height of the tent 6 foot 6 inches? Q: If I pick up the tent instead of you shipping it will you take some of the price off? Trying to save as much as possible for Scout Troop. I am all over each day with my work. A: Yes, if you are able to pick it up from us in Salt Lake City we can offer a better price. You would want to contact us for a special quote. Q: What are the dimensions of the tent and the stakes packed in their bags? Q: how wide is the floor on the inside of the tent? A: The floor is 10' x 14'. Q: What does flex bow mean? A: Flex Bow refers to the rods that hold up the ceiling. You put them into the slots on the t-post. The flexible design allows them to bow with strong tension, - hence, flex-bow. Q: Will your 10 by 14 still be on sale February 3? A: It should be, but we can make any guarantees as prices fluctuate with the raw materials (cotton) to manufacture these tents. Q: If I ordered a tent on Monday how long would it take to get to Cleveland Ohio? A: It would take about three to four business days. 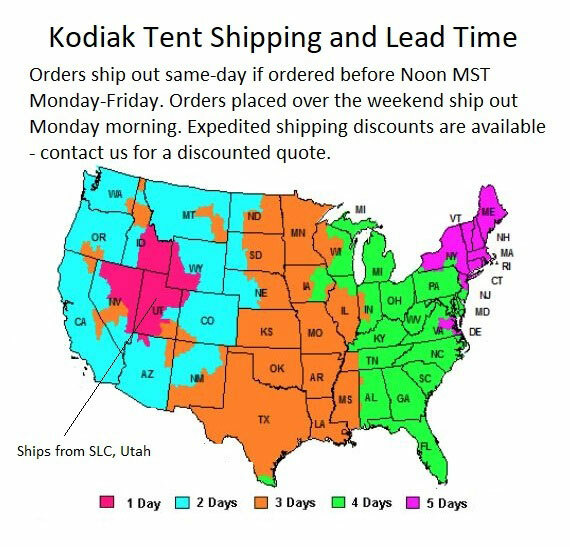 Q: We our scout troop is planning to place an order for 2 and maybe 3 of your Kodiak 6044 tent in the next month. I have seen notes of volume discounts, how many are considered volume and what kind of discounts are offered? Also the online order mentions a tent is worth 100 points. What are the points good for? A: You would need to contact us directly regarding volume discounts. The reward points are redeemable with 200 points equaling a $20 gift certificate to our website. Q: I bought my 6044 from eBay so I could use PayPal can I still buy a ground tarp for 10 dollars thanks guys? 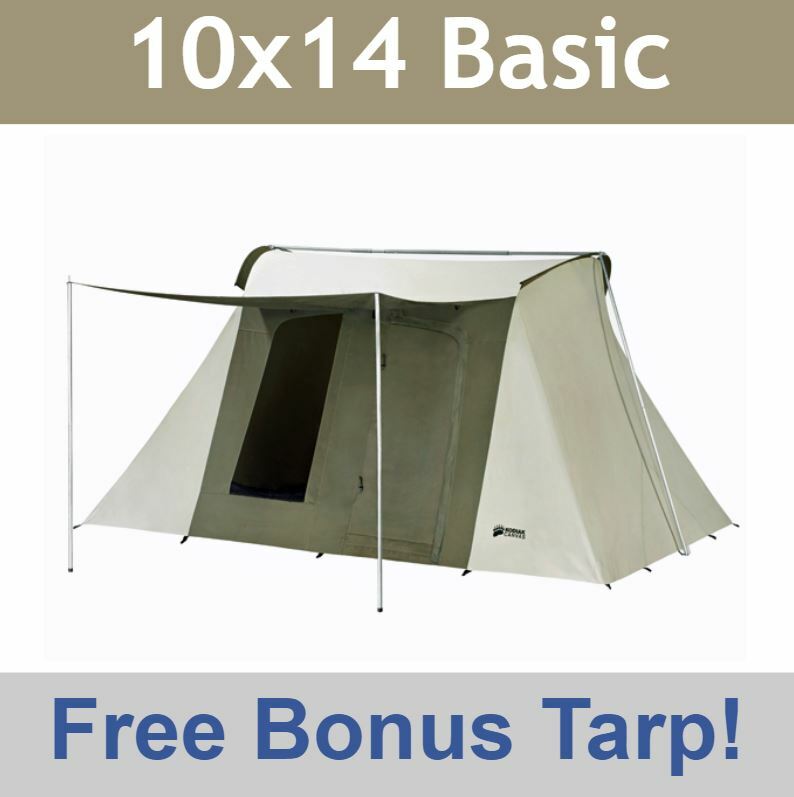 A: One thing to note, this offer for the $10 tarp only works if it is bought from us with the tent, or from one of our other affiliates such as cepauctions, or kodiakflexbowtents. Otherwise you would need to pay the regular $39.99 for the 0514 tarp. A: Sure thing. Just give us a call. Q: Is 8 the maximum number of people you cab fit into this tent or is it the comfortable amount? Dimensions: 49" x 14" x 13"